I can't begin to count the number of second and third grade students I've seen in the past few years who could not efficiently use a pair of scissors. So when working as a support helper for the first three days of school in Kindergarten, I manned a center where the kids only needed to cut. Not on lines, not on shapes, just cut. 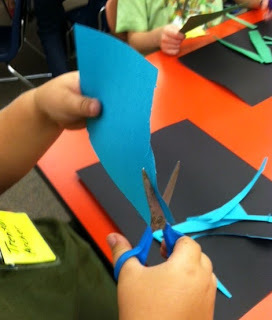 I showed them how to use the scissors -- thumb in the small hole, fingers in the big hole -- and how to hold the paper -- vertically, with the scissors pointing to the sky -- and asked them to cut their paper into strips. Each student was able to choose a color, and in a group of six, everyone had a different color (there were about nine bright colors to choose from) so nobody's strips got mixed up on the table. 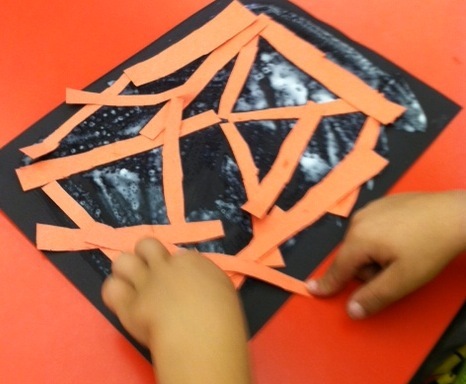 Everyone also got a sheet of black paper to glue their strips on, and to make things easy, I brushed watered-down white glue all over the black paper and they just needed to lay their cuttings down onto the wet glue. This job was all about cutting and nothing else. I always encourage / teach kids to hold their paper vertically, cut pointing to the sky, and to turn the paper instead of the scissors. This helps them be able to see exactly what they are cutting, because the paper and scissors are at eye level. This is particularly important if they are cutting on a line, or cutting out a shape, but for this activity, there were no lines to follow at all, so each child was able to just cut their strips the best they could. 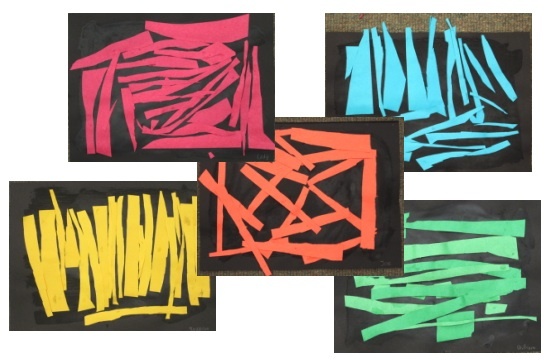 I gave no directions on how to glue them on the paper, and it was interesting to see how the children had different methods for gluing, some being very meticulous and orderly, others gluing the strips in a more haphazard manner. When they were all finished, we had a beautiful assortment of line art, all ready to go on the wall. Even though each child had the same directions, no two of these were alike. I think they made a perfect first art activity!